Holland Releasing, in association with the UCLA Film and Television Archive and Sabucat Productions, is re-issuing newly restored versions of the classic Laurel & Hardy feature films and short subjects to theaters beginning in May 2016. Produced by Hal Roach Studios in the 1920's and 1930's, these hilarious comedies have been in varying stages of disrepair until now. 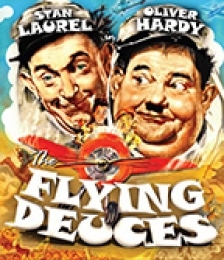 The highlights of these superb Laurel & Hardy restorations include their feature films FLYING DEUCES (1939), WAY OUT WEST (1937) and BONNIE SCOTLAND (1935). However, it's Stan and Ollie's short subjects that are most awaited by fans including THE MUSIC BOX (1932), COUNTY HOSPITAL (1932) and TWICE TWO (1933). According to Holland Releasing president Thomas W. Holland, "Seeing 'The Boys' on the big screen, the way they were meant to be watched with the laughter of a live audience, is magical. Few people know these comedies were originally edited with audience responses timed to the action, so watching them on TV is just not the same experience. These crystal-clear restorations are like seeing the films for the first time." ANOTHER FINE MESS: THE RESTORED LAUREL & HARDY FILMS premieres in Hollywood at the Egyptian Theatre on May 6th and at the Aero Theatre in Santa Monica on May 7th. The series then opens in New York and internationally with play dates scheduled in all major cities.